Americans are increasingly asked to make important decisions about managing our collective water resources. To do so, Water Main believes that people need both Water IQ, an understanding of key issues, and Water EQ, a personal connection to water. How do Americans relate to water? To shed light on that question, The Water Main conducted this national study, How Americans Relate to Water: A Qualitative Study, that asked Americans just that. 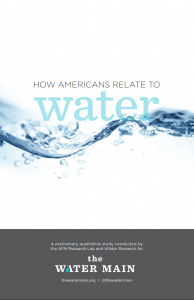 For this study, How Americans Relate to Water: A Qualitative Study, a total of 201 surveys were completed with respondents from 11 selected regions of the United States, for an overall response rate of 5.5%. This exploratory study begins to break ground on a topic that is not yet well understood.